Xsjado bids us goodnight with their final skate release. Paying homage to their very first DL model with unique earth tones of black, brown, and olive green. The Xsjado Farewell Skate embraces the original model while including all the features that make the 2.0 skate superior. After much anticipation the Xsjado 2.0's are now available. This is Xsjado skates all new mold for the Xsjado's featuring some much needed improvements. Namely the new 1 piece soulplate that will now come in 4 sizes instead of 2, ensuring a proper fit. They've also used a better more high quality foam this time around, memory foam to mold to your foot and provide maximum comfort. This skate is avaible as a skeleton, so you would still need footwraps, frames, wheels, and bearings. Xsjado has been testing the 2.0's for years now and they are finally perfect and ready for the wide world of aggressive rollerblading, and these skates have Chris Farmer's seal of approval. 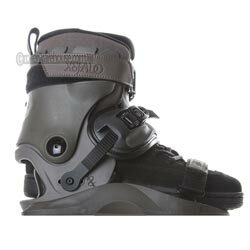 Now if you are unfamiliar with how a Xsjado inline skate works, let me explain: This skate is kind of like a snowboard binding, you put your foot into the shoe (footwrap) and then step into the skate. This skate has 2 velcro straps and a metal ratchet to help keep your foot locked into place inside of the Xsjado's. These blades will be great for vert, street, park, or just cruising around. Xsjado 2.0 are a big innovation in aggressive skating and they are bringing some of the most technical blades to the table.